Horsmonden Cricket Club (HCC) are a Kent village cricket club located near Tunbridge Wells, Tonbridge, Cranbrook and Maidstone. HCC is a club steeped in history as well as being a great place to play cricket. Horsmonden were first recorded playing organised cricket during the Georgian period in 1738 which make us amongst the oldest cricket clubs in the world. Our superb facilities and large ground include a good wicket and outfield, triple bay nets and a pavilion that boasts its own bar, BBQ and space to host parties and events. HCC is a social club and runs regular social events for our Members and their friends and family. 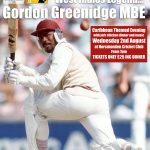 In 2017 we hosted Lashings All Stars vs Jewsons Celebrity XI for a charity cricket match including marquee, stalls, food and funfair which opened our Cricket Week, during which we hosted a marquee event “An evening with Gordon Greenidge”. In the past we have run fundraiser balls such as our amazing Australian Night complete with beach and palm trees, BBQ, outback bar as well as a Caribbean Night with a huge marquee, steel band, disco and auctions. The highlight of the season is our Cricket Week which takes place in the first week of August, as well as our annual Cricket Festival for Juniors the final week of July with a Summer Coaching Course. The club also welcomes Associate Members – so you don’t even need to play cricket to enjoy our warm friendly atmosphere. The classic idyllic picture of sitting under the pavilion verandah with a drink while watching a game of cricket is realised right here! We run three Saturday men’s First, Second and Third XI league teams playing in the Kent County Village League in Division One, Three and Six. Since 2014, HCC also run a non-league Fourth XI who play their home games at Bethany School. TUESDAYS: Training Evenings 6.30pm-8.30pm HCC will benefit from running an intensive training session for senior players. FRIDAYS: Evening nets 6pm-8pm this session will be less intense and more social session. 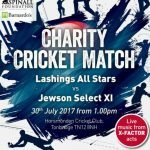 T20 HCC Cannons will be playing several fixtures this year on an ad hoc basis. Most Friday nights from the middle of May sees our social team – HCC Loose Cannons – take to the field strut their stuff! With the PA blasting, black stumps, pink ball and bar flowing, these games are a great way to get back in to cricket even if you haven’t played for years or even never played before! Our two teams Drakes and Minions are made up from Dad’s and Villagers with a few Senior Players to hold it together and Juniors to make up numbers and help out. We also play fixtures against other local outfits such as The Gun pub team and Goudhust Gents. FAMILIES WELCOME! We are looking to have a Women’s Loose Cannons match this season – let us know if you are interested! We have a thriving Youth Section and we are proud to provide competitive league cricket for Under 15, Under 13, Under 11 and Under 9 age groups for boys and girls. Our mission is to provide an environment that challenges cricketers of all levels, whilst also developing the most talented players and providing outstanding cricketing opportunities to all of our players. Find out more about HCC’s Junior Section including Training Session information. We are also committed to providing cricket for those young players who are in the transitional phase between Under 15s cricket and Senior League XIs. 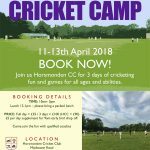 Horsmonden Third and Fourth XI offers a great opportunity for young players to make the transition between junior and men’s league cricket. A good number of players in our ranks have made the step up from the Juniors. Please help us continue this trend! HCC’s coaching is led by our dedicated team of enthusiastic and committed coaches from the club. We also provide Professional Coaching Courses in the Summer and Winter to help Junior Section Members improve their game, whatever their level. We are happy to welcome new Members of all abilities from quality players to occasional knockers for our Senior and Youth Sections. We are particularly interested if you are an experienced cricketer who has had a break from cricket and wants to get back. Use our contact page form to get in touch.